As noted previously, I’ll be running a couple of Barbarians of Lemuria (Mythic Edition) games at North Texas RPG Con. Below you’ll find the pregens for the first game, The Valley of the Ravenous. If you’re planning on being at the con and playing, don’t commit these to memory as they may change a little bit. But for the most part, these will be the characters involved. The youngest daughter of a minor noble family in Liria, Meloria has dedicated herself as a priestess of Estiel, the Lirian goddess of the moon. Where it only served to aggravate her entirely unpleasant sisters, her natural charm has made her a favorite of the temple’s elders, whom she now sees as her real family. Davanzato is an alchemist & artificer from Liria. His patron is Ceria, the Lirian goddess of knowledge and aqueducts. During his brief time in the Esercito Guardia of the city state, he came to know quite a few individuals who would come to be prominent in the underworld. Aevar is a fierce warrior from Geirbjornhal who often calls upon Brogdr, the Geirbjornhaller god of strength and war. After arriving in the “civilized” south, Aevar’s criminal career was cut short and he paid his “debt” by entertaining crowds as a gladiator in the grand colosseum of Liria. Timandra hails from Thaxos, where her greed earned her a reputation she couldn’t shake. She now makes her way in the world by taking anything that isn’t nailed down. Though hardly much of a mariner herself, she still calls on Rasos, the Thaxian god of the sea, in times of trouble. Keziah grew up among the nomads of Zaar. She was groomed by the priests of her people to serve as an instrument of divine justice against their enemies. She regularly swears oaths to Ghev, the Zaari god of the sun. A son of mist-shrouded Kel, Eogan lacks the charm and good nature that are common to his fellow Kelmen. He finds the best companions are those who communicate without words. When pressed, Eogan sings hymns to Dynan, the Kellic god of wine and song and Mael Mav, the Kellic goddess of war. This entry was posted in Barbarians of Lemuria, Kaalmuria, NTRPGCon, Rogues Gallery on April 8, 2016 by the venomous pao. Wherein your humble scribe presents three Barbarians of Lemuria characters and a monster he put together on a whim, for use in his own (highly-derivative) Kaalmuria setting. The Zaaric enchantress lay nearly lifeless on the deck, her skin sickly green from the rolling of the ship upon the churning waters. The captain and his first mate discussed their situation, speaking in a language their were fairly confident the witchwoman did not comprehend. This entry was posted in Barbarians of Lemuria, BoL Bestiary, Kaalmuria, Monsters, NPCs on January 30, 2013 by the venomous pao. Wherein your humble scribe presents a Barbarians of Lemuria villain he put together on a whim, for use in his own (highly-derivative) Kaalmuria setting. Pianova Triosso is a powerful sorceress who makes her home in the Orecchi District of the City of Secrets. She is quite ill-disposed to men, seeing them as little more than chattel to be used to their best ends by women. Pianova seeks to use her arcane powers to overthrow the patriarchy that dominates Liria in favor of a new, women-centric government and will happily destroy any man who stands against her in this mission. She is exceptionally militant about her beliefs and sees any woman who does not stand firm against the barbaric animals called males as a collaborator who is scarcely better than a man (and no more deserving of pity). Pianova is actively seeking out several artifacts she needs to cast some of her more aggressive incantations and heroes operating in Liria will quite likely run into her machinations at some point. 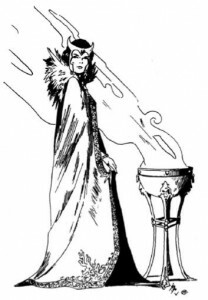 The sorceress employs a number of spies and agents throughout the city’s taverns and inns, and little happens in Liria that she is not aware of. This entry was posted in Antagonists, Barbarians of Lemuria, Kaalmuria, NPCs on January 24, 2011 by the venomous pao. A priest of Sunere Luculum – an obscure Lirian deity opposed to the use of magic – G’antonin Ancente Ecchius acts as judge, jury and executioner in a never-ending battle against dark wizards and those who consort with demons. He mostly confines his activities to the city of Liria and its surrounding regions – both areas are all quite rich with sinners – but has been known to travel the width and breadth of Kaalmuria in pursuit of powerful sorcerers and witches. G’antonin is a man obsessed; stern, brooding, and hard to travel with. But when battle against the dark forces becomes inevitable, there are few men in all of Kaalmuria anyone would want at their side. This entry was posted in Barbarians of Lemuria, Kaalmuria, NPCs on January 21, 2011 by the venomous pao. As moody as his misty homeland of Kel, Tyrnon Vran stalks Kaalmuria with his one true companion – his trusted bow – close at hand. He sleeps with one eye open, for he has been exiled and his enemies are everywhere. Despite this particular misfortune, the Kellic gods still smile upon the archer, helping his arrows fly straight and true when most needed. This entry was posted in Barbarians of Lemuria, Kaalmuria, NPCs on September 10, 2010 by the venomous pao. IN THE LABYRINTH, and most of the FANTASY TRIP material to follow, will be set in Cidri. This enormous polyglot world was chosen as a background for two very good and totally opposite reasons. The first is variety. Cidri is big enough to hold thousands of Earths; it has room for the world of every Game Master who’ll ever put pencil to hex-paper. There’s room here for every sort of fantasy adventure to co- exist — in a logical manner. And it provides a workable rationale for the weird melange of legend, historical fact, pre- history, science fiction, and sheer wild imagination that characterizes the work of the best fantasy gamers. how powerful the dictator’s legions may be on one continent, or how mad and mighty the sorceror-kings may be on another, there’s always room for peaceful lands or beast-haunted forests — somewhere. And, if you like, it can all happen at once. Not that other worlds aren’t possible. The FANTASY TRIP system will work for historical adventures on Earth itself, or for excursions into the past or future of your favorite author. But parts of all these are to be found on Cidri as well — that was why it was created. Enjoy. I took that passage very deeply to heart. And because of it, I’ve never felt the need to adhere to any official setting. And other than the fact that my worlds (and those of my friends) might have been part of Cidri (they probably weren’t, though) and the incredibly loose (or perhaps non-existent) links that some of the subsectors I wandered through in Classic Traveller might have had to the Third Imperium, I never really spent much time in an official setting. Once the slave and consort of The Wolfmage, Astrid Hriedall took every opportunity to learn the magical arts from the canny old wizard, and eventually she won her freedom by besting her master in a game of chess. Now she travels Kaalmuria seeking out sources of arcane wisdom wherever they can be found. This entry was posted in Barbarians of Lemuria, Kaalmuria, NPCs on September 6, 2010 by the venomous pao. A lifetime ago Hrossbjorn was a simple barbarian from the north who went to the civilized lands to make his fortune. Along the way he and his companions fell afoul of an amoral necromancer whose name is lost to time, though not to the Wolfmage’s memory. As a slave to this wizard, Hrossbjorn watched as his companions died one by one, only to have their bodies and souls violated by the dark arts practiced by the sorcerer. One day Hrossbjorn decided he could not stand this fate any further and rose up against the necromancer. Strangely, the spells flung at Hrossbjorn failed to affect him, and his mighty thews quickly dispatched the old wizard. And though his animal wildness won, Hrossbjorn was never able to forget the power displayed by the magician. Ever after Modolfr Hrossbjorn sought as much magical power as he could find, and soon became known as The Wolfmage. This entry was posted in Antagonists, Barbarians of Lemuria, Kaalmuria, NPCs on August 24, 2010 by the venomous pao. Tov Reuel is an itinerant, muscle-bound seller of religious tokens and artifacts from the plains of Zaar. He has traveled far and wide across the face of Kaalmuria, and learned many things – not least which is that he is somewhat less than graceful and possesses no skill with ranged weaponry. Tov has a distinct weakness for the ladies and will happily spend nearly every Sha’im he has on a chance to revel in their affections. Further, though he has precious little skill at creating poetry, he is entirely unashamed of his meager abilities and will happily make up whatever doggerel he can think of and apply it to any circumstance he faces. This entry was posted in Barbarians of Lemuria, Kaalmuria, NPCs on August 14, 2010 by the venomous pao. Hailing from proud Thaxos, Creus Orsellios is as at home on the sea as he is in the laboratory. Once known for his uncanny prowess as a ship’s lookout, Creus lost his left eye in a fight against a group of pirates and hopes someday to discover a means of replacing its function alchemically. Still, the man known as “The Hawk” manages to spot things even those with two eyes miss. Creus has developed an alchemical admixture that allows even a novice sailor to retain his footing on deck in even the roughest of seas. Some captains have paid him handsomely to provide them with this “Deck Gum” when they are setting out on a voyage to the northlands, where the storms are strong and unpredictable. And when he himself sails, Creus always takes least enough of this material to last a full week. This entry was posted in Barbarians of Lemuria, Kaalmuria, NPCs on August 7, 2010 by the venomous pao.